Just how popular can a beard be? When it’s attached to well-loved Isle of Wight musician Paul Armfield then the answer seems to be: very popular indeed! For weeks now Paul’s beard has been collecting friends on Facebook, and speculation has been mounting as to what might actually be found underneath it. When at last the time came for it to be removed ideas ranged from a number of previously unseen chins to a winter festival for Santa and his elves, and even a used car lot. Yes, the beard was THAT big! It was a very brave and generous gesture from Paul, sacrificing his beard along with his long, pony-tailed hair, all as a fundraising stunt in aid of The Bhopal Medical Appeal. Paul became ‘The Bhopal Beard-Pal’ with a mission to raise as much money as possible and the Islanders seemed to take to his mission with some gusto. The ‘beard-off’ event took place on Sunday, the 2nd January at the popular ‘The Bargeman’s Rest’ pub on the Isle of Wight. The Bargeman’s is well known for hosting great live music and very kindly donated the use of their space for the evening. The interest was such that it quickly spiralled into an all-day event with all sorts of musicians offering to come along in support and play free of charge. The afternoon started with ‘Gypsy Jazz’, a fantastic folk jazz trio, featuring one Mr Paul Armfield on double bass! There are some incredibly good musicians tucked away on the Isle of Wight and Gypsy Jazz certainly gave a taste of the great music in store for the evening. The evening opened with a live debut from talented, young singer Daisy Woodley playing a couple of songs solo with her guitar. Daisy was great, showing real promise, and we’ll surely be seeing a lot more of her! Next up Were Martin Makrill and Dave Godby, of the Radiotones, accompanied by one Mr Paul Armfield on double bass! Another great set, by Stick Man followed bringing us dangerously near to the main event: the big beard-off. But after Stick Man came a spontaneous performance with the surprise addition of a couple of very talented children! Step forward Sol Grimshaw (son of JC) and Wilf Armfield (son of Paul) who both showed enough musical skill, keeping their folks on their toes… The impromptu line-up included various grown-ups and parents, including one Mr Paul Armfield on double bass! By this time the Bargeman’s’ was absolutely heaving. There was a palpable sense of excitement building up to the main event. The performance area was cleared and a stool brought forward ready for the big shave-off. Just as the barber appeared, and Paul took to his stool, the doors swung open and a barbershop singing group sashayed into the room. But not just any old barber shop quartet! No, Paul’s beard was truly massive and this was a barbershop group to match – consisting of no less than 12 singers! ‘Wight Harmony’ were the perfect accompaniment to Paul’s shave-off having chosen just the right tunes to raise a few laughs. Paul was, at this stage, otherwise engaged and unable to accompany Wight Harmony on his double bass! The shave-off began in earnest, interspersed with drawing the rest of the raffle, and accompanied all the way by the singers. Debby, from Beresford’s in Cowes, at the helm of the clippers, made relatively light work of what was, after all, a huge head of hair on a very big man. Paul’s changing appearance was just incredible, every sweep of the clippers being met with whoops of glee from a packed house. Then, ‘behold Superman’, or at least a new Paul, as the final locks bit the dust. The crowd were visibly astounded at the transformation they’d just witnessed as his huge head of hair vanished – along with what seemed like a fair amount of ‘apparent years’. A new Paul emerged, one with a face that none of his friends and family had seen for very many years. He looked stunningly good, a real handsome guy! After the beard-off, the festivities resumed with a real party atmosphere as the music recommenced. We were treated to brilliant performances from both Rachel’s’ Reason who really showed us all the depth of talent on the island. Finally, an all-star performance to round the night off (and to give Paul the chance to get back on his double bass!) as a group of long-standing friends, and well-loved island musicians, came together for a real one-off treat of a performance. This was a group of very talented, highly experienced musicians and it was plain to see how inspired they all were by the incredible warmth of what was a truly memorable event. Thanks go to everybody that donated in support of this event. 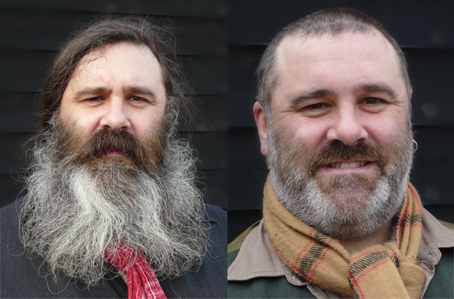 We are still expecting one or two more online donations but, thus far, Paul’s ‘beard-off’ has raised over £3000! Debby from Beresford’s, Cowes – the barber! Raffle prizes – Dragonfly (Julie Jones-Evans), Dale Evans (Handmade jewellery), Chocs Away, Bette Young, John & Anne Toogood. Running the raffle – Alice Armfield, Daisy Bagget, Anne Toogood. The musicians – Rachel’s Reason: Rachel Day; Doug Aldred; Scott Anderson; Rafe Spencer & Mick Smith. Special thanks to Rafe for also supplying the PA.
Last but not least… Big Paul Armfield on the double bass!